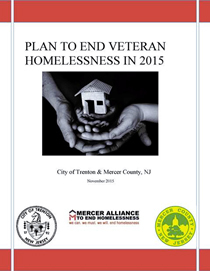 The Plan to End Veteran Homelessness in 2015 was unveiled by the Mercer Alliance at a public event held on November 10th. The event was hosted by Mayor Eric Jackson of the City of Trenton to announce that the Mayor and County Executive Brian Hughes had accepted First Lady Michelle Obama’s Challenge to End Veteran Homelessness by the End of 2015 and that the challenge would be met. All 79 identified homeless veterans will be housed.